Baked varnish coils of this type can be found below. 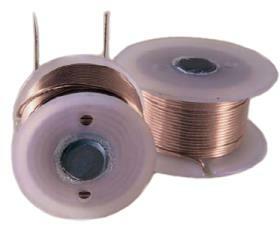 Their product ID starts with "b"
Copper foil coils can be found at the end of this page. Please note: The power values Pmax in the following tables were determined at 20 degrees Celsius ambient temperature and free convection. They are just a guideline and - since we are not the manufacturers - cannot be guaranteed by us. *) Pmax 8 Ohm is the maximum power that this coil is able to deliver to the bass driver. The values are valid for free air convection and 20°C. For 4 Ohm speakers this value has to be halved. Copper foil coil (cfc) with excellent three-dimensionality and attention to detail; they belong to the group of exceptionally neutral .